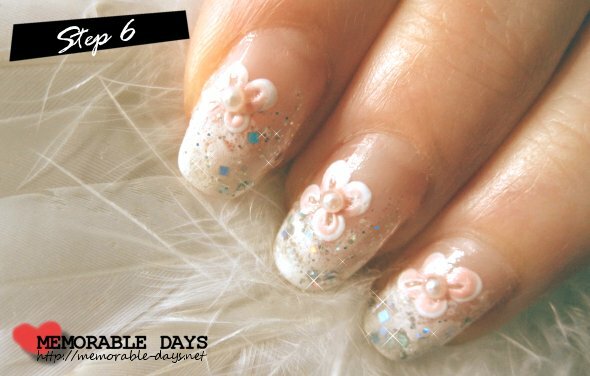 Easy & Cute Flower Nail Art Tutorial | Memorable Days : Beauty Blog - Korean Beauty, European, American Product Reviews. This is probably my easiest nail art tutorial that I have done so far xD. 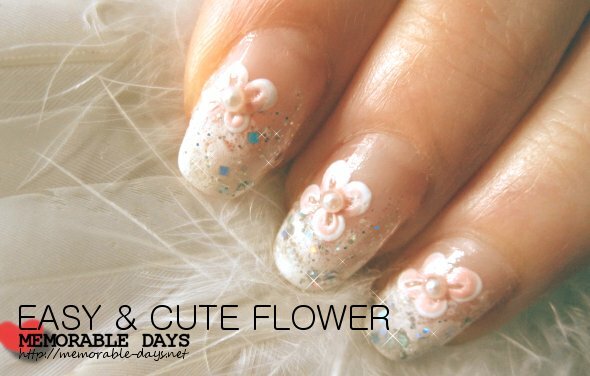 In this blogpost I'm going to teach you how to put some cute flowers on your nails :). Keep on reading if you're interested. 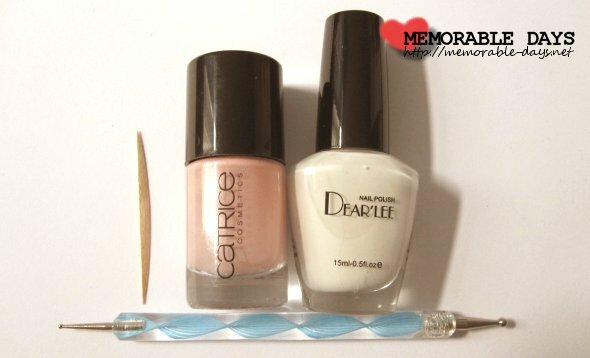 You will need a white and a pink nail polish (The colors are optional), a toothpick, a topcoat and 1 or 2 dotting pens. I'm going to use the blue dotting pen this time, you can also use 2 dotting pens for this tutorial (the green and the blue one). 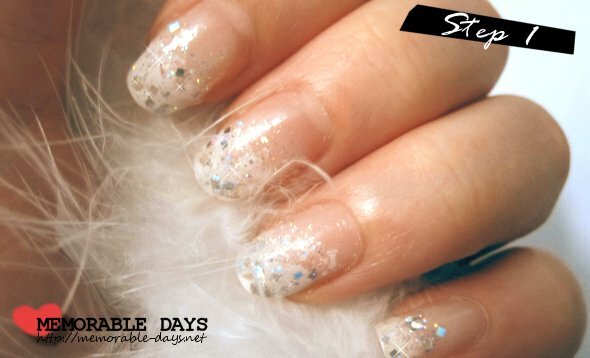 Step 1: I created something similar to this nail art tutorial: Christmas party nail art. I just changed the red nail polish into a white one ;). The white version was actually my NOTD for my sis' wedding :D. Looks ok right?! Step 2: Use your blue dotting pencil and put 4 white dots on your nails. Don't have to let this dry. Step 3: Use your green dotting pencil and put 4 pink dots on top of the white dots. Let this dry for 1 second. Step 4: Use a toothpick and draw a line starting from the middle of every dot. It should look like that (see picture below). Step 5: When the flower is dry, you can apply a white dot in the middle or you can put a small pearl at the middle of every flower. Make sure to put a little bit of top coat or glue at the middle of the flower before applying the pearls. This wheel is sponsored by Born Pretty Store. There are many many pearls in one wheel and this is really my favorite wheel that I have! The pearls are so pretty ^^ and there are a lot of different sizes in it. I'm definitely going to use this wheel more often in my tutorials. People often use these for Gyaru nails :D. Would you like to purchase this wheel as well? 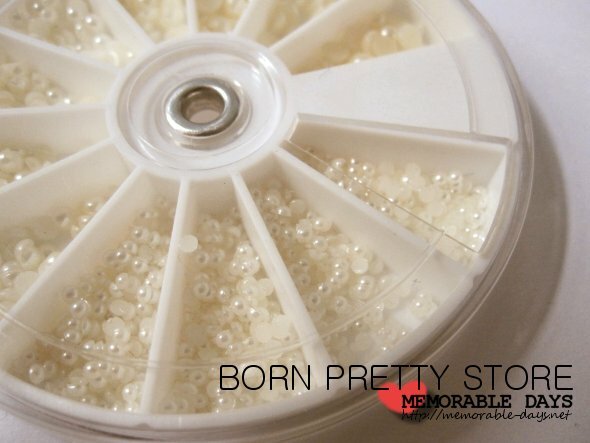 Go to this link: Born Pretty Store Pearls Wheel. Step 6: Apply a top coat and you're done ;). I hope you liked this easy nail art tutorial. Like I said, it's probably the easiest tutorial that I have done :P.